Soviet spy Helene (“Leen”) Kullman was shot by the Germans on this date in 1943 … or was she? Kullman (English Wikipedia entry | the much more detailed Estonian) was just out of teaching school when the Germans occupied Estonia. She joined the Red Army and was eventually trained as an intelligence agent, infiltrated by parachute behind German lines in September 1942, and arrested by the Gestapo in January 1943. 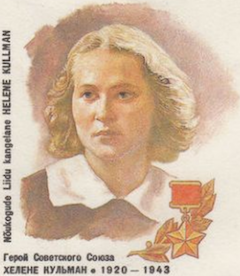 According to the Soviet hagiography that resulted in her decoration as a Hero of the Soviet Union in 1965, Kullman defied her torturers and was shot by them on March 6, 1943: a standard Great Patriotic War martyr. Almost everything about her available online is in Estonian; readers with that particular proficiency might also enjoy this 1965 radio interview with her sister.